Just over a year ago millions of people joined the Women’s March to protest Trump’s presidency and his comments about women. Although it was wonderful to see so many people turning out to protest President Trump, much of the feminism at the march wasn’t intersectional. Intersectionality is a crucial part of understanding the experiences women go through. “It's important for people to feel like they have a place in a movement regardless of sexual orientation, gender, class, race [etc. ],” said junior Natashia Otiso. The day after Trump’s inauguration, millions of people filled the streets to protest his presidency at Women’s Marches held around the country. It seems that because of Trump’s demeaning behavior towards women, a new feminist movement had been ignited. 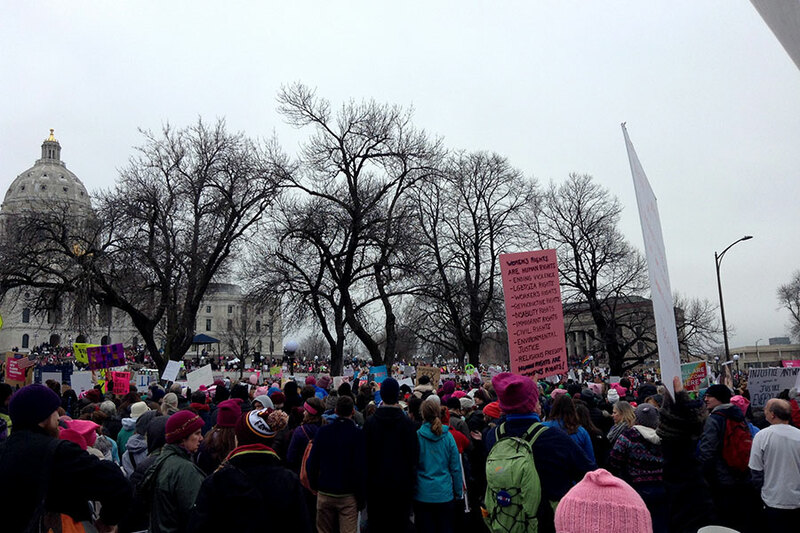 Like many other Minnesotans, we were motivated to join the protesters walking through St. Paul streets to the Capitol that day. While there, we experienced invigorating and empowering feelings as we marched with so many people carrying signs and yelling chants testifying to women’s power, solidarity, and enduring belief in a different kind of world. Yet even in the midst of it, we felt waves of discomfort as we noticed the march appeared to be dominated by white people. We remember reflecting on this discomfort afterward, and asking ourselves: why was the march, and so much of the current outrage in response to Trump’s presidency, exclusively focused on women? Why did it seem that the concerns of white women were so prominent in the feminism that we were seeing – especially given that Trump’s despicable behavior targeted so many marginalized groups? What about all his comments on immigration, and his disrespect towards Muslims? What about his insulting imitation of a reporter with a disability? Something about the march did not feel fully inclusive. It was clear there was something missing: true intersectionality. Intersectionality is necessary for any inclusive, progressive movement. According to South sophomore Shadia Nurein, “[Intersectional feminism is] when all types of [concerns and perspectives] are incorporated into your feminism… It’s about the LGBT community, it’s about people of color, it includes trans women and low-income [women], different religions, stuff like that.” To create true progress for everyone, feminism needs to be intersectional. In reality, every woman in American faces experiences some type of gender oppression. Yet women of color, LGBTQ+ women, women with disabilities, and others face oppression for multiple reasons that make living life as a woman even harder. This is why it’s more important than ever that feminism includes bringing awareness to all different kinds of oppression that women face. Feminism that doesn’t acknowledge the different types of oppression marginalized women can face is categorized as white feminism. Historically, mainstream feminism has solely consisted of white feminism. During the women’s suffrage movement in the 1920s only white women eventually gained the right to vote. The 1960s feminist movement was more concerned with issues that pertained mainly to white women such as dismantling the image of the “happy housewife.” These historical trends persist within the feminist movement today and need to be addressed. “White women are so privileged and they obviously need to be feminists… but there are so many women… who definitely don’t have as many privileges as they do, and they get so overlooked,” said senior Lydia Zupanc. Within the feminist movement, the wage gap is commonly brought up to show how women are not treated equally to men. However, the statistic often used that supposedly illustrates the inequality all women face actually only pertains to white women. According to the National Committee on Pay Equity, white women earn on average 77% of a white man’s earnings. What usually goes unmentioned is that black women earn 66%, Native women earn 57%, and Latina women earn 54%. The significant disparities between groups, often goes unmentioned and the compounding effect of race on gender oppression is often disregarded. “White feminism is [when] white women think their way of being a woman is the only way of being a women… Not saying that their problems aren’t relevant, but they don’t look at other peoples issues and what they have to go through,” Nurein said. For effective and impactful feminism it is crucial that as cis white women we recognize our privilege and fight all types of discrimination, while making sure to not to overshadow the voices of women from historically marginalized groups. Feminism is as much about recognizing your own privileges as it is about recognizing your oppression.